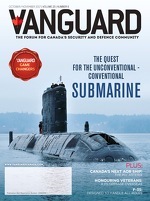 For almost a decade, Vanguard has the unique opportunity to partner with DEFSEC Atlantic. DEFSEC Atlantic is the second-largest defence event in Canada that is held each year in Halifax, Nova Scotia. With what started out as a small show, DEFSEC has grown into an event that attracts over 1,000 people every year from Canada and beyond. At the recent DEFSEC show, I had the opportunity to speak with quite a few individuals from industry and government about many issues that we face within the defence and security industry. This gives me a better understanding of the industry and provides additional resources and strategies to help fulfill the role that Vanguard is playing within the industry. Having the opportunity to brainstorm with many of you at the event is one of the building blocks for serving the industry. What stands out is, not just the issues, but the many ideas and solutions that came about because of our interactions. For instance, we are planning our next C4ISR event that will take place on January 30, 2018. A few experts from this field offered suggestions as to topics to consider for the agenda. Many highlighted the problems within this field and provided solutions. I appreciate all the feedback, suggestions and comments and as we work on shaping the agenda for this event I look forward to continuing the conversation with you. One of the main features for the October/November is on the Quest for the Unconventional – Conventional Submarine by Norm Jolin, CFN Consultant. In this piece, he talks about how the new Canadian Defence Policy reiterated the need for the RCN to have a balanced fleet of platforms, which includes submarines even though it was not specifically mentioned. He delves into what Canada needs in a submarine and how is it different from other Allies who operate submarines. He points out that the submarine that Canada requires must be able to patrol off the coasts, deploy worldwide as well as operate in the Arctic. Does this submarine exist? Be sure to read Norm’s article. In his piece on the F-35, Chris Black writes about the technology behind this fighter jet and how from the outset it was designed to handle virtually all roles. He also talks about artificial intelligence and as this becomes more advanced, the F-35 will become more deadly by extension. In recognition of Remembrance Day and the 100th anniversary of Vimy Ridge, we have a piece by Nujma Bond from the Royal Canadian Legion about some of the stories from a group that went to Vimy, France recently. The group weaved its way through the regions of Caen and Dieppe, into Ypres in Belgium and ending in the Arras area back in France so as to get an understanding of the sacrifices that were made by virtual strangers for us. Learn more about their stories in this article. For this issue, we are excited to announce two Game Changers: John Mannarino, President of Mannarino Systems & Software Inc. and Jim Quick, President and CEO of Aerospace Industries Association of Canada (AIAC). John by combining entrepreneurial and continuous improvement culture within his company is working to become a supplier of choice to best serve their customers. Jim through AIAC is changing the game within the industry by being a good program and policy partner with the government so as to provide the best ROI to their members. I hope you enjoy this issue as much as we’ve enjoyed putting it together. Terri is the editor-in-chief of Vanguard.